Print out this festive and Patriotic Pennant Banner free printable. 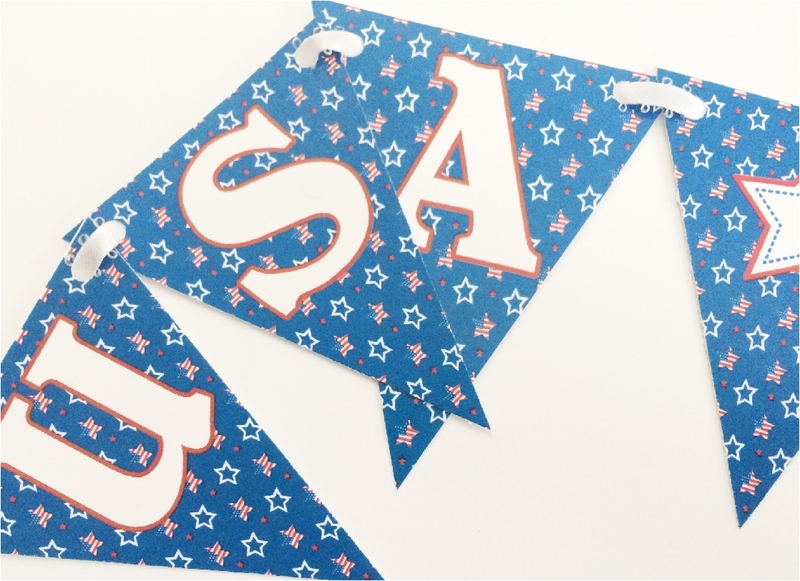 With it's super cute Uncle Sam graphics and the beautiful USA themed stars, you'll be able to wish a Happy Birthday to the USA and decorate for your Patriotic Party all in one party decoration. 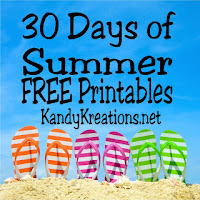 Every summer for the past three years, I've been taking the month of June a little slower and celebrating summer with 30 days of Free Printables. I try and create some fun party and summer printables that will help you bring some extra fun to your summer parties. These printable posts may not always be the most refined, but they are free printables that you can save and print today for some holiday or party fun. 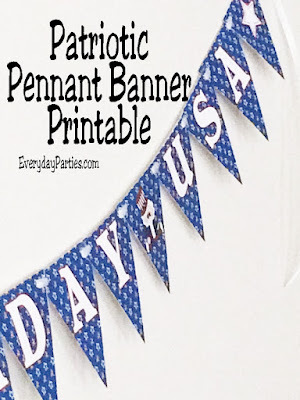 I'm kicking off June with today's free printable--a Patriotic Pennant banner perfect for your 4th of July party, a memorial day party, or a patriotic birthday party. Since this is the first day of June and the last day of school, today's printable is a little more elaborate than some will be this month. 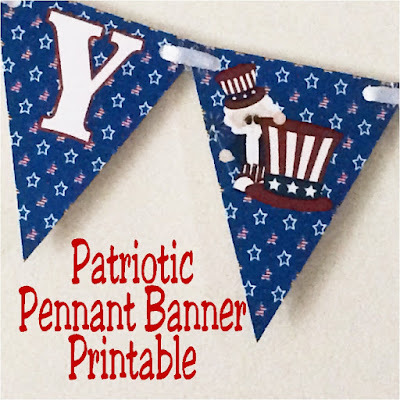 This patriotic pennant banner has three 5x6 inch pennant triangles on each page. The banner spells out "Happy Birthday USA". As a fun break between the words, there are two star pennants and two Uncle Sam pennants. To get this Happy Birthday USA patriotic pennant banner printable, you need to go here to my dropbox account and download the file. Since this files contains seven JPG picture files, it needs to be zip filed and saved there. To use this file, you need to download and save the pennant banner file. Then, use your computer's program to unzip the file. If you don't unzip it, you won't be able to print, only to preview. Once it is unzipped, go ahead and print out the graphics, cut out, hang, and party away! Be sure to come back tomorrow to see what Day 2's printable is. Or visit our 2017 30 Days of Summer Free Printables page for all the Printable fun.